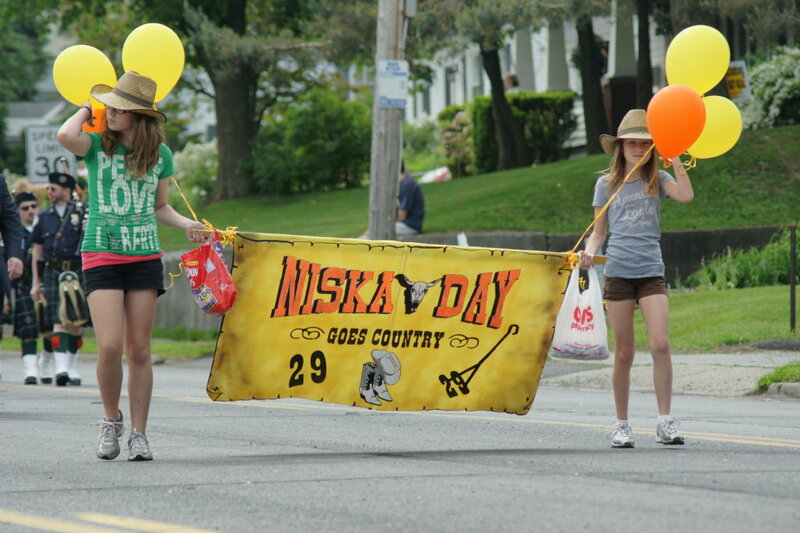 That’s what my neighbor Mary calls Niska-Day. The kids (all four of them, because of our sleepover guests) were up super-early, then there was parading, candy catching, biking to the festivities, general frolicking, playground-playing, biking back, hitting the neighborhood party, and in just over an hour there are fireworks. J begged to go to the fireworks and has since collapsed onto the sofa, fast asleep. We fully intend to wake her up, try to force some dinner on her, and pack her off to the fireworks. W promised that they could go, so hopefully she’ll be able to regain consciousness. I agree: it’s probably a really bad idea. The day’s highlights included the giant slippy slide and M’s stunning 43-second ride on a mechanical bull. We also realized, after we’d sat down in the grass for a snack, that we were downwind from the cotton candy stand. Every other minute a fresh breeze blew little wisps of cotton candy through the air, and I told the girls that they could eat whatever they could catch before it hit the ground. It was like catching snowflakes, except infinitely more rewarding. I mean, I love snowflakes, but this was cotton candy, man. Hope everyone enjoyed the day!